Lola Hutchins, 91, of Bardstown, passed away Tuesday March 26, 2019 at Georgetown Community Hospital. 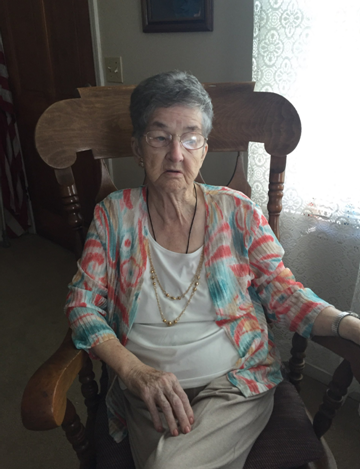 She was born December 15, 1927 in Marion County, a dietary and nurse assistant at Nazareth, member of Bardstown Senior Citizens, and St. Joseph Catholic Church, where she was a part of the bereavement team, prayer group and adoration. She was preceded in death by her husband, James Millard Hutchins Sr.; three sons, James M. Hutchins Jr., Herman Hutchins, and Joseph Hutchins; daughter, Christina Hutchins; three grandsons, Joseph Herman Hutchins, Jessie Ray Basil, and Braden Jude Karr; and several brothers and sisters. She is survived by seven daughters, Judy (Bruce) Wheeler of Cox’s Creek, Joan (Joe Pat) Mattingly of Bardstown, Patsy (Paul) Swiderski of Georgetown, Cathy (John) Clark of Bardstown, Renee (Calvin) Bald of Middletown, Alice Hutchins, and Denise (Joey) Hayden both of Bardstown; four sons, Leo Hutchins, and Phillip Hutchins both of Summersville, South Carolina, Paul Hutchins of Bardstown, and Tim Hutchins of Tallahassee, Florida; thirty grandchildren; several great-grandchildren; sister, Imelda Greenwell of Bardstown; and several nieces and nephews. Her Funeral Mass will be 10:00 am Saturday March 30, 2019 at Basilica of St. Joseph Proto-Cathedral, with burial in St. Joseph Cemetery. Rev. Minh Vu will officiate. Visitation will be 3 – 8 pm Friday March 29 and 8 – 9:15 am Saturday March 30 at Barlow Funeral Home. A prayer service will be held Friday evening. Memorial contributions may go to masses or St. Joseph Catholic Church Bereavement Team.